In 2013-14, black K-12 students were 3.6 times more likely to receive at least one out of school suspension than their white counterparts. Often, students of color are then funneled into juvenile detention, a gateway into the adult prison system. This phenomenon, in which children of color are suspended or even arrested on school grounds, is so common it has a name: the school-to-prison pipeline. Sixty-four years after Brown v. Board of Education, schools remain unwelcome spaces for minorities. The question for society is what can we do about it? To this end, the Coalition is pleased to share the From Brown v. Board to Ferguson toolkit. 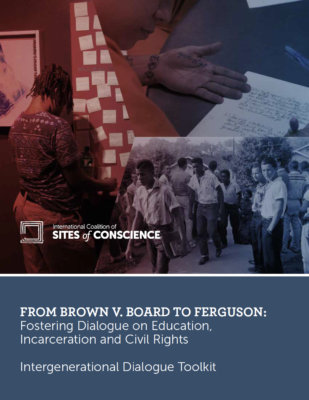 The toolkit, which you can access here, is the first of two to be developed by the Sites of Conscience members participating in the IMLS-funded From Brown v. Board to Ferguson: Fostering Dialogue on Education, Incarceration and Civil Rights program. The toolkit contains 11 examples of inter-generational dialogue on this vital topic as designed and implemented by our member sites with support from their community partners. The toolkit also contains an introduction by Program Manager Tramia Jackson, articles on Sites of Conscience dialogue from Sarah Pharaon and Tammy Bormann, and evaluation tools developed by our participating members working with Project Evaluator Conny Graft. This project was made possible in part by the Institute of Museum and Library Services [MG-20-15-0072-15]. The Institute of Museum and Library Services (IMLS) is celebrating its 20th Anniversary. The Institute of Museum and Library Services is the primary source of federal support for the nation’s approximately 123,000 libraries and 35,000 museums. Our mission is to inspire libraries and museums to advance innovation, lifelong learning, and cultural and civic engagement. Our grant making, policy development, and research help libraries and museums deliver valuable services that make it possible for communities and individuals to thrive. To learn more, visit www.imls.gov and follow us on Facebook, Twitter, and Instagram.